Marchetti brings the theoretical perspective of recent writing on race, ethnicity, and gender to her analyses of film and television and argues persuasively that these media help to perpetuate social and racial inequality in America. Noting how social norms and taboos have been simultaneously set and broken by Hollywood filmmakers, she discusses the "orientalist" tensions underlying the construction of American cultural identity. 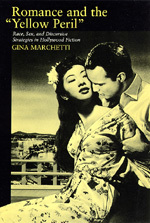 Her book will be certain to interest readers in film, Asian, women's, and cultural studies. Gina Marchetti is Assistant Professor of Film at the University of Maryland.